Silicone bakeware is all the rage right now. And I must admit I’m in love with all of it! 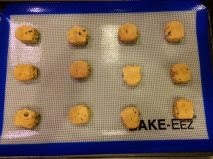 The Bake-Eez Mat comes with a coordinating oven mitt which is also silicone. Bake-Eez promises the mitt will protect you hand while you are removing items from the oven or stove. They also promise baking matt will not burn, smoke or smell up your house. It also promises to help make baking easier. So I decided to try it out for myself. 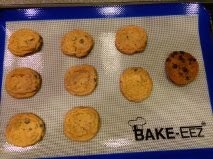 Tonight I baked chocolate chip cookies to test out the baking mat and oven mitt. Now I did take a little short cut and use premade cookie dough. (Just trying to save a little time) First step was to take out my tray and place the Bake-Eez mat on it and then place the cookie dough 2 inches a part. I baked the cookies per the directions. No special accommodations are needed because you are using the silicone mat. 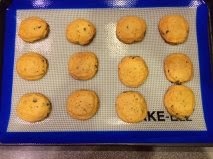 The cookies called to be baked at 350, During the 10 minutes the Bake-Eez was in my gas oven with the cookies I did not smell any odors or burning. I removed the cookies after 10 minutes and let them cool a little to firm up. This was when I got to use the silicone glove. Wow! I was impressed. I did not feel any heat and I had complete control of the tray the whole time. And it fit extremely well. As you can see from my pictures the cookies baked evenly. There were no scorch marks. Clean up was as a snap. Once the silicone mat cooled I washed it with warm soapy water and let it air dry. Very simple. I would definitely use the Bake-Eez mat and glove again. However you will most likely want 2 gloves and at least 2 mats if you like to bake or cook. If you want to buy your own Bake-Eez head over to amazon where you can choose them in red or blue. I received Bake-Eez at a discounted price for evaluation purposes. Regardless, all opinions expressed are still 100% my own. I am disclosing this in accordance with Federal Trade Commission 16 CFR, Part 255 Guides Concerning the Use of Endorsement and Testimonials in Advertising.